Whenever, I boil dried beans of any sort, I make sure I cook a little more than I need. I love eating a few plain, nice and warm, just after they've cooked. Sometimes, I keep some aside to add to a salad. It just adds another dimension to the salad. This is exactly what I do when I boil dried chickpeas. If you want to know how its done, check this post. I simply love the colors. Mix all the ingredients together in a bowl. Check for salt and sourness. Keep chilled till you're ready to serve. Beautiful salad! Garbanzo beans are a family favorite around here but I have never tried to cook them from scratch. Where do you get your dried beans? I haven't seen them at my local grocery store. The next time I'm out I will have to take a closer look. Thanks! I love chickpea salads and how colourful they are! This one looks especially tasty! Emily, I'm in India, so the local grocers have them. You may get them at a store that stocks Indian food items. I'm pretty sure the tinned beans will work fine too! The colors are stunning and I am sure the taste is as great Trisha! I love chickpeas! This salad looks wonderful! I don't think it would last very long in my house. Thanks for sharing your recipe with the Hearth and Soul Hop. Can't wait to try this! Looks so appetizing! 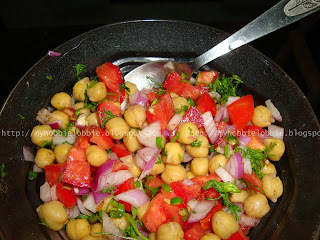 Nice and yummy chick pea salad, Love chick peas, thanks for sharing with Hearth and Soul blog hop. Thank you Alea, Tina and Swathi! Mmm, this looks totally healthy and tasty. Love all the bright colors. Monique, let me know if it works for you, I've never tried it with couscous! trisha - this chickpea salad looks awesome! i hope that you'll stop by and share it at mangia mondays! Kristin, I've just linked up!!! This is definitely a salad I'd love to try. Trisha, you have a real talent for combining flavors for maximum deliciousness! I'm definitely looking forward to trying this recipe, and am always so delighted to have you be a part of "A Little Birdie Told Me..."